Rick Stein has spent over 40 years mastering the art of seafood cookery. His passion for fish and shellfish has taken him to all corners of the globe, and formed the foundation of his award-winning restaurants. In his latest book, Fish & Shellfish, Stein shares his skills and passion with readers, as he takes them on a journey through 120 recipes, including dishes from France, India, Australia and Spain. He offers a smorgasbord of recipes, from fish soup with croutons, to cod and lobster chowder and penang road laksa, as well as many other delicious starters and light salads. A firm supporter of sustainable farming and fishing techniques, Stein provides readers with 60 step-by-step instructions for preparing all types of seafood. Readers will learn how to poach fish to perfection, salt your own cod, clean and steam mussels, and perfect the skill of cooking lobster. 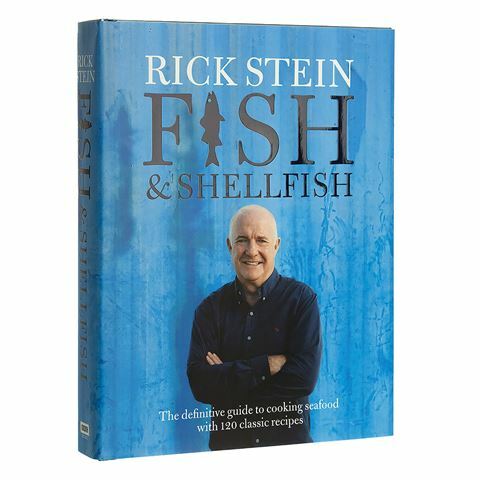 Rick Stein’s Fish & Shellfish is the must-have guide for any seafood lover. You’ll be filleting, grilling and griddling like a pro in no time! Includes 120 classic seafood recipes, with full colour photographs throughout. Beautifully presented in a lovely dust cover. Book divided into chapters – buying fish, equipment and ingredients, techniques, recipes and seafood families. Dimensions: 20cm (w) x 25.5cm (h) x 3.5cm (d).